The Msgr. William Noè Field Archives & Special Collections Center at Walsh Library is excited to announce the launch of its new searchable archival database, ArchivesSpace. Researchers can now use ArchivesSpace to discover what the Center has in its holdings. Digital archival content will be available through ArchivesSpace in the coming months. The Archives and Special Collections Center recently had conservation work performed on some important pieces from the collection. One of these is a 1787 edition of Thomas Jefferson’s Notes on the State of Virginia. This edition was the first English-language edition of the text that was made widely available. (Its very first printing in 1785 was a small run of only 200 copies, which Jefferson distributed himself to friends and colleagues.) Notes on the State of Virginia was the only one of Jefferson’s books to be published in his lifetime, under his supervision. The copy held by the Archives and Special Collections Center still contains the fold-out maps and tables, which were frequently removed from this type of work in the past and are rarely found intact. 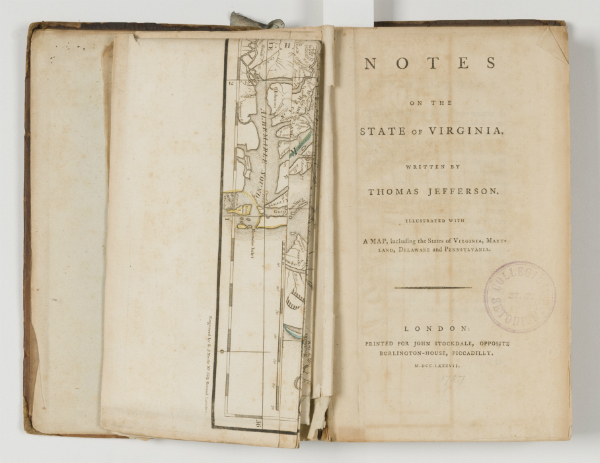 Notes on the State of Virginia before treatment, showing the fold out map settled at a slight angle and damage to the leaves, especially near the bottom of the spine. 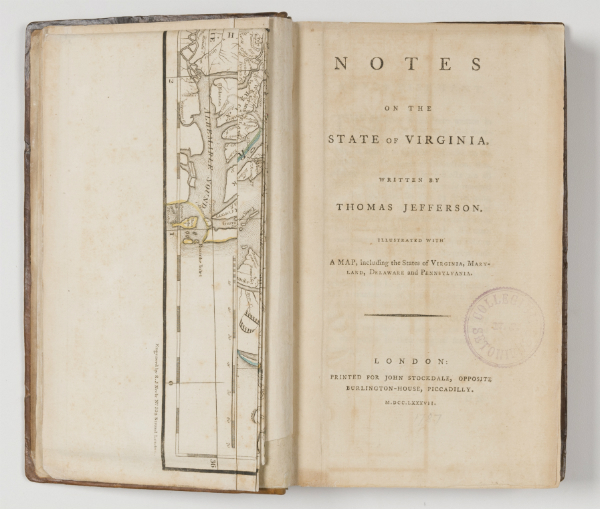 Notes on the State of Virginia after treatment, showing the leaves and cover attachment mended and the map re-attached to sit correctly in the volume. 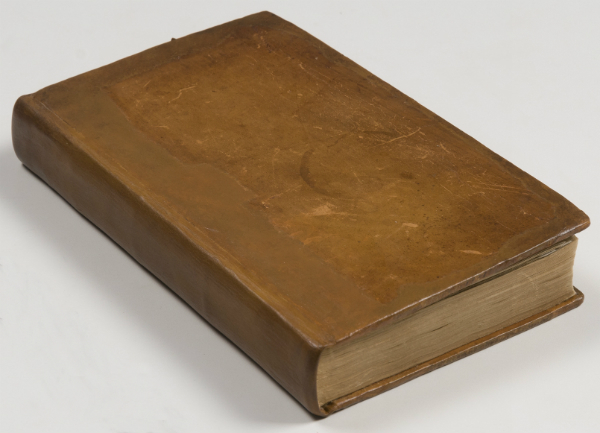 While the book is overall well-preserved, at 230 years old it was in need of some conservation treatment in order to make it stable enough for handling and display. In particular, the leather covers were desiccated and especially worn around the corners. The covers had detached from the text block, and were reattached at some point in the past with black cloth tape. These types of repairs can often do more damage than good, and in this case the tape had discolored the leather on the spine and left adhesive residue. The large map at the front of the volume had a tear running from its attachment to the text block to its first vertical fold, and many of the pages had small tears, creases, and surface staining. To address these issues, we took the volume to the Conservation Center for Art and Historic Artifacts (CCAHA) in Philadelphia. Damage caused by the use of adhesive tape to reattach the book’s covers. 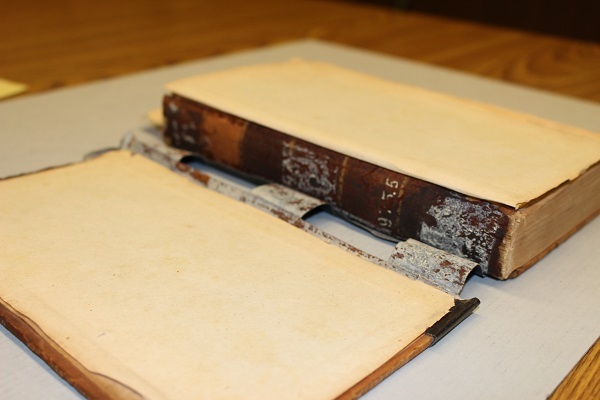 Conservators at CCAHA used a variety of techniques to correct the condition issues while preserving as much of the original binding as possible. The desiccated leather was consolidated—a technique in which a solution is used to penetrate the leather and adhere the leather fibers together. 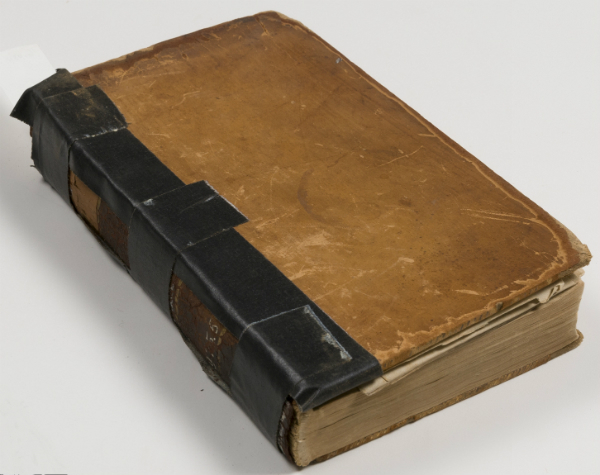 The black tape was removed from the book’s spine along with the spine leather, which was too damaged to salvage. The spine was then cleaned and re-covered with new leather dyed to match the existing covers. New endbands, additional sewing supports at the top and bottom of the spine, were also added to match the style of the old ones. They surface-cleaned accumulated dirt from the pages and mended the tear in the fold-out map. The covers were humidified and flattened, then re-attached to the text block. A custom clamshell-type box was created for the book, using archival materials. Before treatment: abraded covers and amateur tape repair. After treatment: leather consolidated and spine repaired, with the leather toned to match the new material to the original covers. Now that the volume has undergone treatment, the book can be handled and displayed without fear of causing further damage to the volume. Since care was taken to match the original materials and style, the repairs made to the binding keep the original character of the volume while greatly improving the book’s stability. With these measures, we will be able to have this treasure of American history in our collection for the next 230 years!